Few people, it must be said, probably yearn for a mini keyboard that vaguely resembles the unholy union of a pasta shell with an accordion. And when that pairing lures an iPad mini to its bower? Then you get products like the TrewGrip. But, try as one might, there's no getting past the feeling that maybe, as ridiculous as one would look with the thing, that the TrewGrip is genuinely useful. What is it? It's a bit difficult to describe. Conceptually, the TrewGrip is nothing more than a Bluetooth QWERTY keyboard. Except one that's typed upside down. With hints. And is actually just a pair of sleeves. The TrewGrip docks phones and tablets up to 5.3 inches wide using what the company calls "microsuction" for holding the phone or tablet securely. Actually using the TrewGrip is an odd experience, because on the back of the TrewGrip, you'll find a "standard" QWERTY keyboard, but split in two and backward, so that you type as if you're holding a steering wheel. The keys feel robust and responsiveness enough. And--here's the kicker--LEDs light up on the front of the device, telling you what buttons you struck without directly seeing them. The keyboard is battery powered, with 10 hours or so of juice. 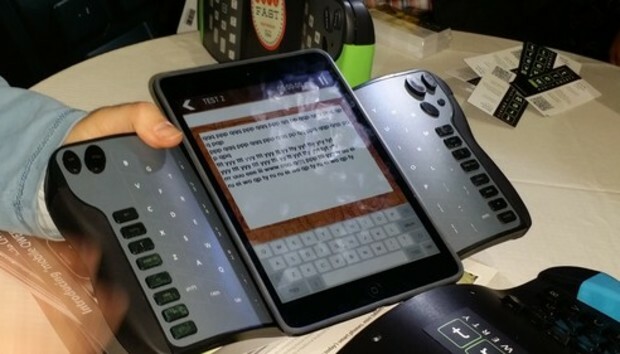 "Essentially we made it--if you know the QWERTY key layout, the muscle memory is going to be the same," a company spokesman told TechHive during a demo at Sunday night's CES Unveiled event. "If I reach for the 'Y' with my index finger on a flat keyboard, I'm using the same finger. Within about an hour, you'll be able to type as fast as you type with your thumbs. Within 6 to 8 hours, you'll be within 85 percent to 95 percent of your efficiency." The spokesman also claimed that a normal 130 words-per-minute typist at the company was at 110 WPM, after being given a TrewGrip the night before. "We all have tablets, but they don't make us more productive," the spokesman added. "We simply become better at watching movies or playing games." The key, obviously, is a keyboard. If that's too much for you, that's not surprising. The TrewGrip failed initially as a Kickstarter project, but company executives say they're back and ready for another, self-funded go. It's hard to believe that the TrewGrip would pass the executive test--or just a plain old Bluetooth keyboard. It certainly has the executive price, though: $250 or so, deliverable during the holidays of 2014. On the other hand, if you want a conversation starter at your local coffee shop, does TrewGrip have a product for you.